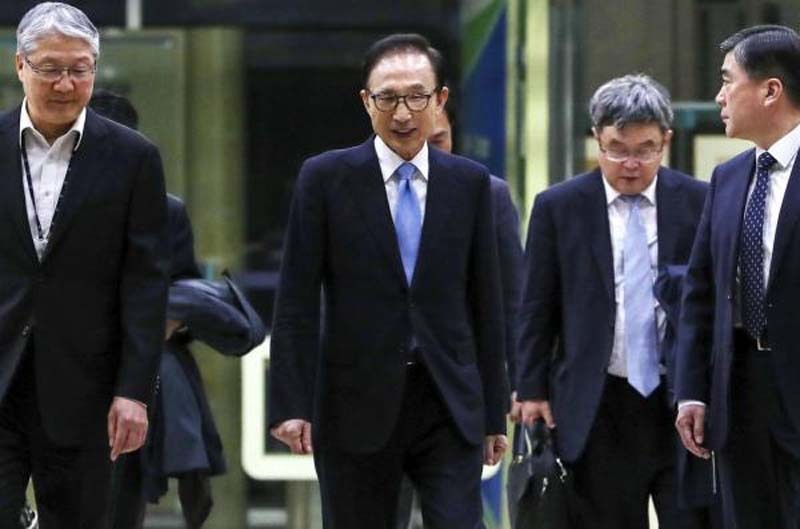 Former South Korean President Lee Myung-bak (2nd from L) leaves the Seoul Central District Prosecutors' Office in Seoul, South Korea, on 15 March 2018, after more than 21 hours of questioning over multiple corruption allegations. Photo by Yonhap. Former President Lee Myung-bak will stand trial over a slew of corruption charges, including bribery, tax evasion and abuse of power. The Seoul Central District Prosecutors' Office announced on Monday that it decided to indict the former leader on 16 charges, making him the fourth president in the country's history to face trial, YTN reported. Lee has been largely accused of receiving $10 million in kickbacks. These include $654,000 from the country's National Intelligence Service through his presidential aides, and some $5.85 million from Samsung Electronics to cover lawsuit expenses for an auto parts firm called DAS, which he has been suspected of owning. Prosecutors also believe Lee embezzled some $31.6 million through DAS to fund political campaigns and his household expenses. Other charges made against him include tax evasion, breach of trust, and violating laws on presidential records. A raid on the Seoul office of DAS last month uncovered more than 3,400 presidential documents stashed away in a secret storage room. The 77-year-old has denied most of the charges against him including the ownership of DAS, claiming the investigation is an act of political retaliation by the liberal Moon Jae-in administration. After he was arrested by prosecutors who aimed to question him under detention, Lee refused to cooperate all three times that they attempted to interrogate him, saying he cannot expect them to conduct a fair investigation. Lee could be sentenced to at least 20 years in prison if he's convicted of the charges on abusing presidential powers for personal gain, Yonhap reported. Prosecutors are expected to widen their probe on corporate figures and members of Lee's inner circle, who are believed to have offered him bribes. They are said to be considering indicting his wife, Kim Yoon-ok, over allegedly delivering millions of won to Lee from Woori Financial Holdings. Their son Lee Si-hyung is also likely to stand trial over embezzlement and breach of duty in relation to DAS.